I could always picture myself as Jean Harlow (sans blond hair) wearing a long, satin, bias cut 30’s evening gown. I found my ticket by sewing up Simplicity’s 75th Anniversary pattern, 5876. Finding the pattern, new and uncut, in my size, at a VERY reasonable price before I saw a ‘sold’ notice…made my persistent waiting pay off! I was excited to challenge my comfort zone by sewing a formal, fully lined, historical garment. It is funny, because this dress did indeed proved to be a mind-crunching, yet incredibly fun challenge…yet this is the only garment I can (so far) say is completely perfect. 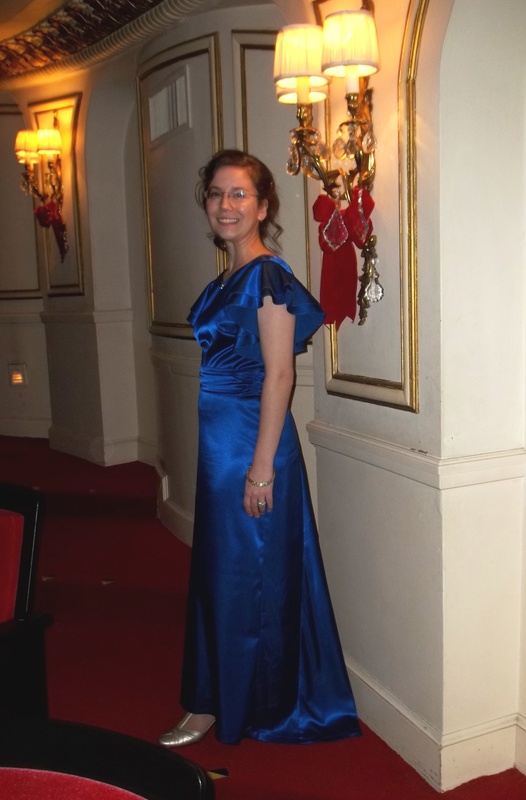 My evening gown is so wonderful to wear, and I love it like no other project! Simplicity 5876 was actually easy to sew together, just a bit time-consuming all the same. It also turned into a very good learning process along the way to completion. Most of all, I need to thank Michelle L for her sewing advice and my husband for doing so much ironing, marking, and sharing late nights doing my sewing just to help me finish something amazing! 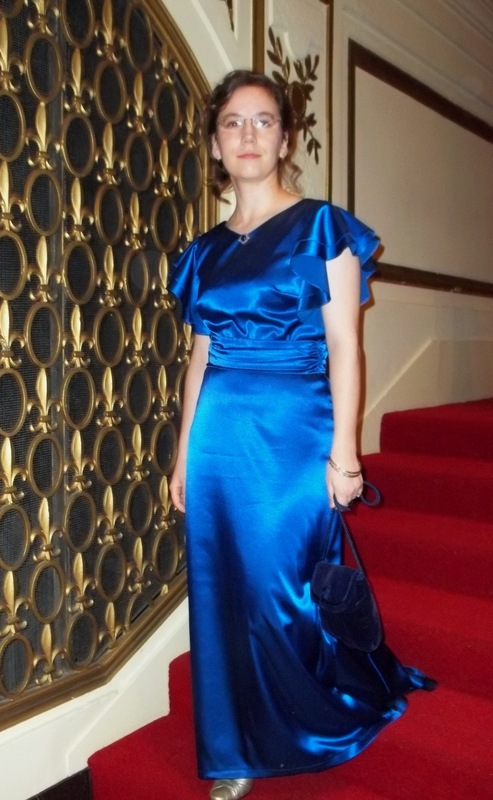 Liz and Laura Mae lately made dresses very similar to my blue formal gown from their Simplicity 5876. I suppose great minds think alike! Here’s a shot of the dramatic deep V back neckline and the godet-style train. TIME TO COMPLETE: I took several hours stretched over a week just to cut and mark the pieces properly; then I/we assembled the dress in 4 days of evenings and late nights; so technically the dress was finished on Oct. 16 (2012) at about 40 hours of work, but, after a wardrobe snafu and time to make things perfect, I really finished on Dec. 31. I stopped counting time after December came, but probably a total of 50 hours. They were SO worth it! THE INSIDES: Very clean, indeed! No seams are showing because the lining is ‘wrong-side-to-wrong-side’ covering up most seams, and the few that are exposed (such as the waist and godet seams) I finished in the bias tape.See what I mean in the picture below at left. I chose to make view A, trying to stick to the classic 30’s flutter sleeve, wide shoulder look, and keeping with the deep, silky colors that were popular then by using a royal blue. 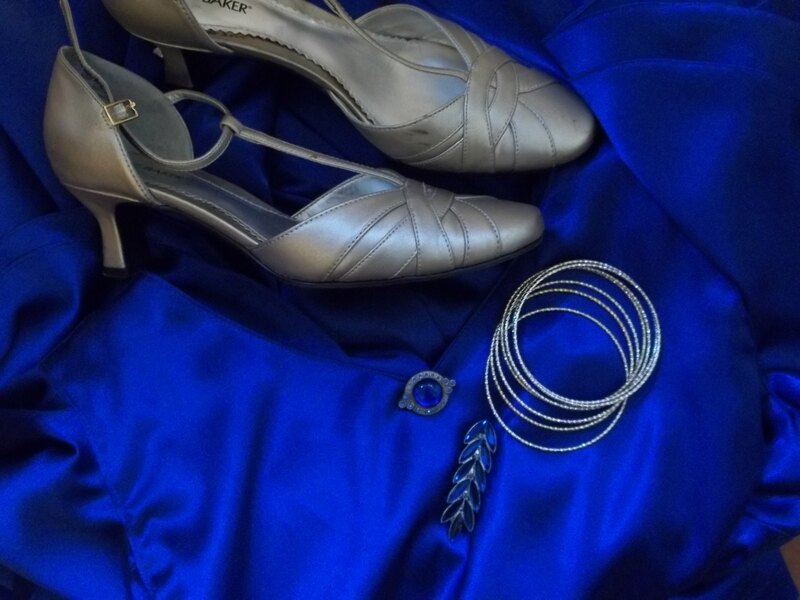 I actually looked at a good number of vintage gowns, old patterns, and 30’s era movies (especially “Atonement”) to help me decide on this combo for my dress. 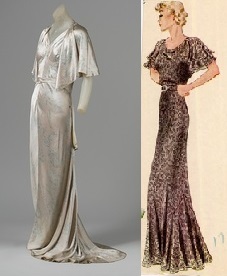 My ideas tended towards looking like the white 1929 House of Patou original at right or Simplicity 1719’s cover drawing at right (in picture below). It was really amazing how calm (non-stressed/freaking out) I was through the whole sewing process, and I am glad I resisted the urge to rush things and do all the pain in the neck steps to acquire new skills. There were several major labor intensive parts that demanded a good back rub afterwards! Firstly, for sewing the interfaced neck facings, I had a hard time getting the interfacing to stick to the crepe-back. Plus, the low heat of the iron (because I didn’t want to scorch the fabric) was not doing the job. Also, I had raised the bottom of the back V several inches, but did not properly adjust the facings as well. Ooops! 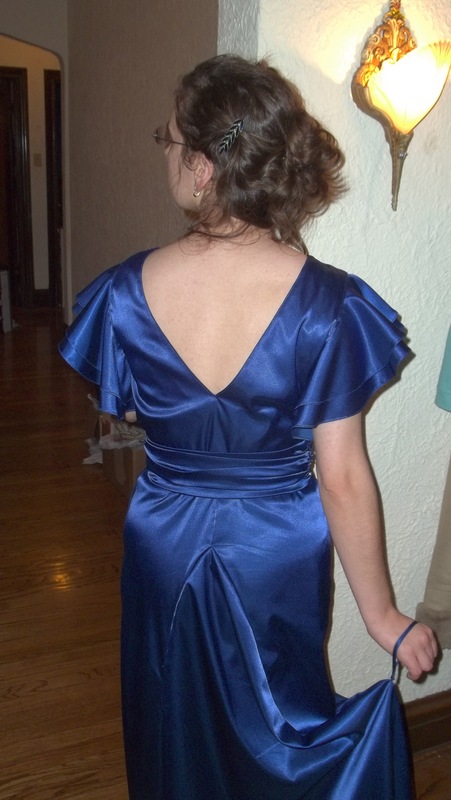 The result is 1/4 inch higher than the original pattern, but it is not my planned 1/2 inch higher V back neckline. 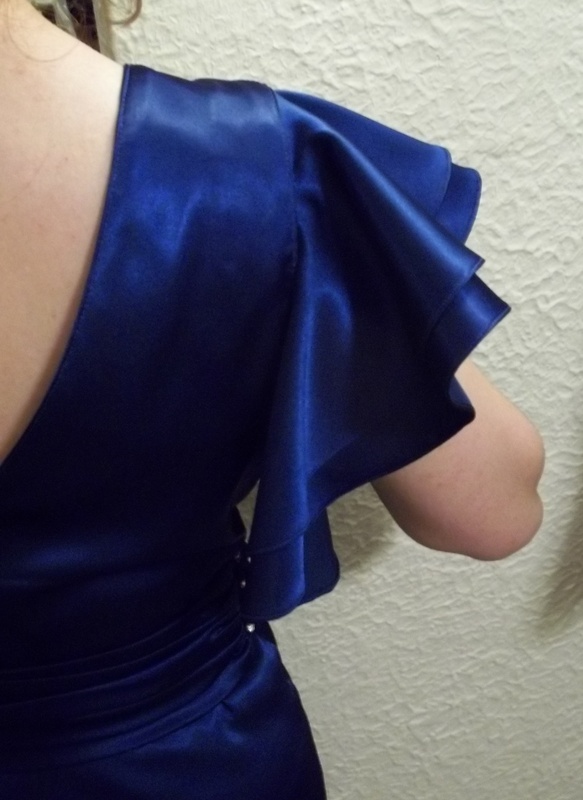 Secondly, the flutter sleeves are something I’ve never done…basically a circle with a hole in the middle for your arm. Hubby and I were a great tag team working on the sleeves, and I do not think I would have done all 4 of them otherwise if he hadn’t helped out like he did. I would sew 1/4 in. from the outer edge to mark and stay stitch the hem, then he would iron this edge under like a hem. I would sew on the very fold of that hem he ironed down, and cut away the excess fabric very close to my stitching. Next, hubby would roll under this small hem with the iron, so I could make one last line of stitching to end up with a 1/8 in. hem. Do I hear you thinking…yeah, crazy, wasn’t it? The cummerbund was very fun to make and so much easier than the instructions made it seem. The gathering turned out nicely, and I really liked making my own matching loops. Armhole facings were sewn in by machine, with much unpicking and re-sewing, on account of frequent catching of the sleeves. However, I hand stitched everything else around the sleeves. 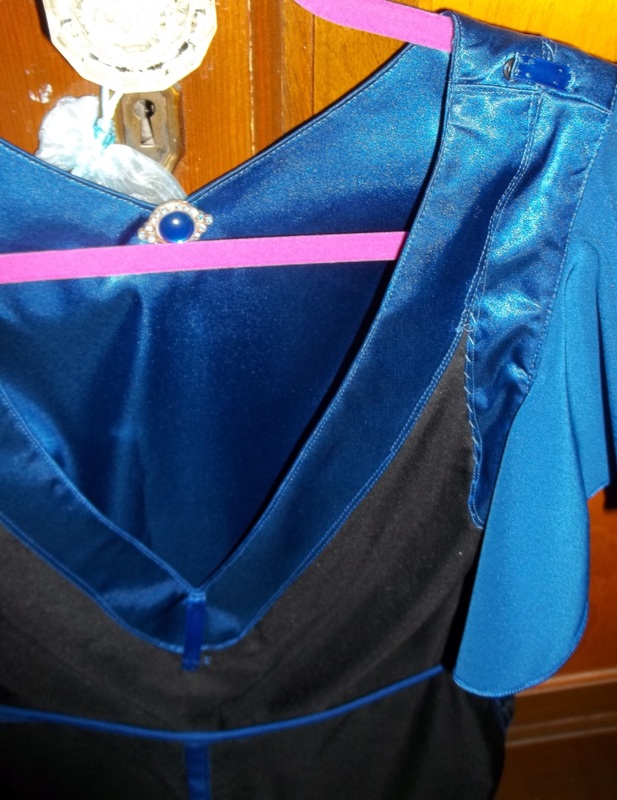 The interfacing ends were sewn in to just the lining and I added some ribbon loops to keep the dress in place. There are loops at the shoulders to go through my bra straps, and thus end the dress’ problem of slipping off my shoulders. Later I added another loop at the bottom inside of the back V to keep my bra strap from showing. 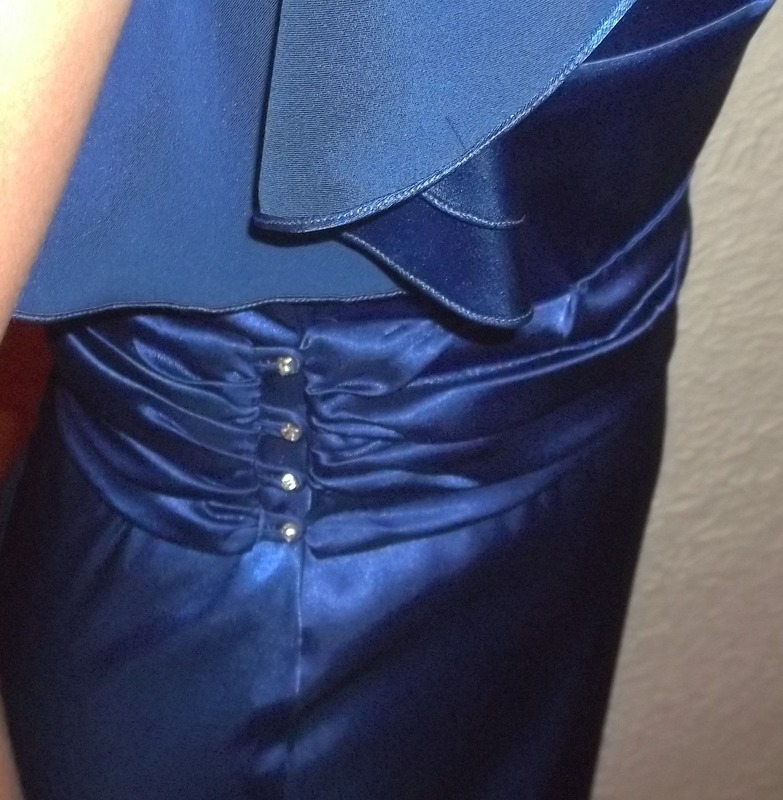 The final hard part to my dress was sewing in my first…and my VERY LAST…invisible zipper. Here’s what is in the side instead…yes, snaps. The way I figure it, snaps are much more ‘authentic’. At the same time, there isn’t much that can go wrong with snaps. See the right picture. However, taking my time to do the darn invisible zip right cost me a good 2 1/2 hours. I am so proud of how perfectly it looked when I finished the zipper. My husband couldn’t believe it was there at all! Unfortunately, I don’t have a picture of how well my invisible zip looked because there is a ‘sewing snafu’ horror story that ruined my happy ending. So here I was trying on the dress, with my husband done with marking the hemline. This was at 1:30 A.M., early morning, with 17 hours before I was hoping to wear this dress to go out. I bent down to show him something when I felt a rip and heard a pop. The invisible zipper had popped apart right in the middle. Both of us tried to realign the teeth together or even pull the zip down, but to no avail, and by then I was hot and upset. I just pulled the zip apart so I didn’t have to sleep all dressed up. I found out I would have the occasion to wear my dress by the end of the year, so I took advantage of the extra month to perfect any little details. I made an extra cord and sewed it as a wrist strap to hold up my train from my hand. There is a tiny hook hidden in the side seam for the wrist strap to hook onto. I even spent a few evenings trying, but not doing a nice job, to sew an invisible strap bra, but the loops I sewed inside were much simpler. Wearing this dress is an excellent self-esteem boost. It makes me so happy! I did get a number of looks at that New Year’s concert, and I wish I would have asked them a penny for their thoughts. If it wasn’t for the motivation and inspiration of Sew Weekly and all the other wonderful members out there I really cannot see myself sewing something like this a year, or even several months ago. Let’s keep up the great sewing!!! 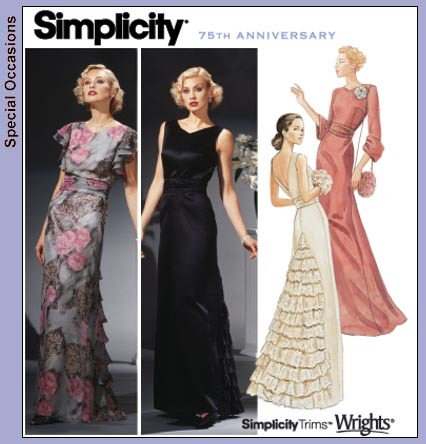 This entry was posted in 1930s and tagged "Simplicity pattern", 1930's, dress, evening gown, flutter sleeves, satin, Simplicity 5876, Simplicity 75th Anniversary pattern, vintage by kellycb. Bookmark the permalink.